Warning: The video in this post is graphic. 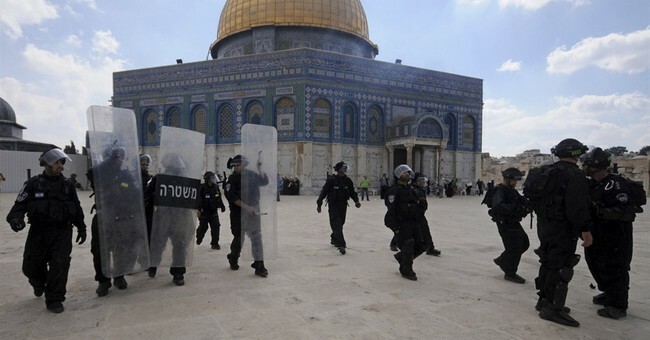 Three Palestinian terrorists opened fire on Israeli police officers Friday morning on the Temple Mount in Jerusalem. One officer was ambushed in what appears to be the Muslim Quarter of the Old City, just outside of the Al-Aqsa Mosque. Two Israeli police officers, Major General Eyal Sattawi and Kamil Shanan, were killed. Sattawi leaves behind his wife and three week old son. Shanan had planned to ask his girlfriend to marry him in the coming weeks. Following the morning's attack in Jerusalem, the video clip of the security cameras, which illustrates the first moments of the serious attack this morning, killed the policemen, Major General Eyal Sattawi and the late Kamil Shanan. An initial examination of the incident, as seen in the video, shows that the terrorists were present in the Temple Mount area armed, taking advantage of the use of the holy site and the easing of restrictions on it, in order to allow freedom of religion and worship on the Temple Mount. Shortly after 7:00 AM, the terrorists went to the tribal gate and fired at the policemen who were at the time, and later the terrorists fled back to the Temple Mount area. Another video taken by a bystander shows one of the terrists lying on the ground pretending to be dead. When approached by police, he got up and was killed. There are reports he also stabbed a paramedic trying to treat him. At the end of the video, someone watching from the Muslim Quarter yells "Allahu Akbar!" in an expression of sympathy and solidarity. Three terrorists in total were killed by police. Palestinian leader Mahmoud Abbas called Israeli Prime Minister Benjamin Netanyahu to offer condolences.